This beautifully decorated, modern six bedroom villa with a west facing pool and stunning views across the lake is the perfect choice for your family holiday. Situated just off the US192, Disney is just a fifteen minute drive away. King-size bed, walk-in closet, ceiling fan, large TV. En-suite bathroom contains corner bath tub, shower cubicle, double sink, separate WC. King-size bed, slide closet, TV. En-suite bathroom contains shower over bath, sink, WC. King-size bed, walk-in closet, TV. En-suite bathroom contains shower over bath, sink, WC. Bunk beds - one double and one single bunk, slide closet, TV. Family bathroom between bedroom 5 and 6 upstairs, contains shower over bath, sink and WC. Cloakroom next to living area downstairs, contains sink and WC. Sitting on the picturesque resort-style community of Terra Verde, this modern six bedroom villa offers your family the perfect place to stay in Orlando. From the west facing pool deck with views across the community lake to the nicely decorated, well-equipped games room, you are sure to be well entertained during your stay. 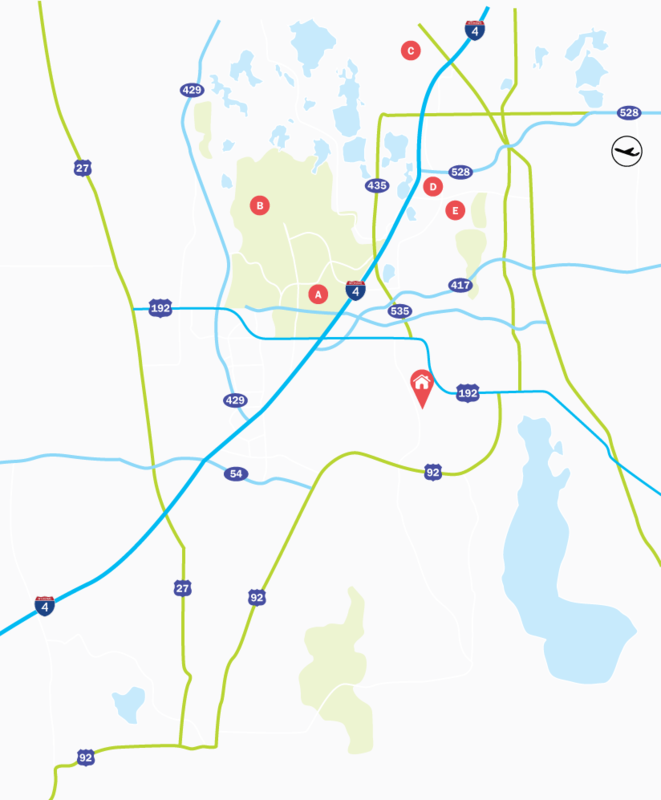 Located just off the US192, Disney theme parks are just a fifteen minute drive away and Universal Studios and SeaWorld are just a twenty minute drive away. Living Accommodation - Immediately to the left of the front door as you enter the villa, is a modern formal living area with a sofa, loveseat and chair. Adjacent to this living area is a dining area with seating for six people. Continuing through the villa is the open-plan kitchen area with a large, high-top island table and seating for eight people. Opposite the kitchen is the family lounge area with a “L” shaped sofa and a large flatscreen TV with a DVD player. Bedrooms - The Master bedroom is to the right of the family lounge downstairs and has a King-size bed and an en-suite bathroom. All other bedrooms are upstairs, bedroom 2 is to the left of the landing and has a King-size bed and an en-suite bathroom. Bedroom 3 is to the far right of the landing and has a King-size bed and an en-suite bathroom. Bedroom 4 is opposite bedroom 2 and has a King-size bed and an en-suite bathroom. Bedroom 5 is to the right of the stairs and has bunk beds, the bottom bunk being a double bed and the top bunk being a single bed. Bedroom 6 is between bedrooms 3 and 5 and is a Minion themed bedroom with twin beds. Outdoor Living - The west facing pool deck with views across the lake to the rear of the property has a spa as well as a good-sized covered area containing two dining tables, one seating six people one seating four people. The perfect area for all the family to relax in the beautiful Florida sun. Entertainment - The well decorated, modern games room is equipped with a pool table, an arcade game, air hockey, table football and a TV - making this well-equipped games room the perfect place to get everyone together for some fun.